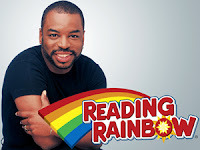 I grew up on Reading Rainbow. There is a long list of books that I'd read because of this show. My favorite episode(s) were the ones that dealt with the work that went into making the effects for star wars and the then new Star Trek. I'm not going to try nitpicking the new service. I don't own an iPad so it'd be like trying to have an opinion I have no way of trying out. Am I disappointed there's no android app, or something for the iphone? Of course. While I can understand the need to design for a single architecture why not design for a wrapper that you create for each platform? Why isn't there a website for this? Or even a series of Youtube videos put up by PBS so it could live on? On the face of it i don't see why it has to be the ipad. However in video La Var did say he was wanting a certain level of quality. My problem with this is by targeting the iPad you effectively have limited your audience. Those things are not cheap and from where I'm sitting that keeps this rebirth out of the hands of children that most need incentive and help figuring out books are a good thing and reading can and will take you places. Lavar. I love ya man. The News Reading Rainbow would get canceled back in 09 made me cry. Reading the news that it was coming back now made me cry again. Do better than this. Help make this easier to access for those that don't have. I realize you picked the platform you picked because it offers performance and uniformity, but no matter how wonderful the experiance it's worthless if it cannot reach the masses.